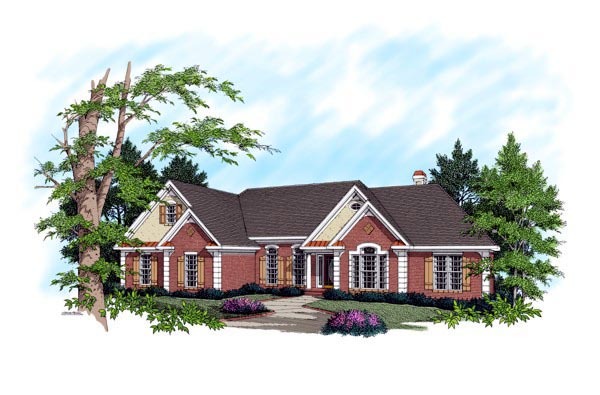 This elegant home is an upscale variation of our most popular design. The inviting brick and stucco exterior is accented with quions, multi-level trim, copper roofing returns, and "Country French" shutters. It's plush master suite, over-sized secondary bedrooms, 2-1/2 baths, and optional bonus room are just a few of the features which have made this our most popular layout ever. The master suite has been expanded and now includes a 14' high glass bay sitting area. Just off the luxurious master bath is an enormous 8'x10' walk-in closet. An abundance of windows brighten the breakfast room and kitchen. Vaulted and raised ceilings adorn the living, family room, dining, foyer, kitchen, breakfast, and master suite. The family room has also been expanded and now features a corner fireplace and 12' gliding patio door. The secondary bedrooms which measure apx. 14' x 12' and 14'x11' share a compartmentalized bath. The master bedroom, breakfast room, family room, and bedroom 3 all provide access to the full-width deck. A basement foundation is included with this plan.